So today I started my new book on wattpad – ‘Writing Tips 101: How To Be A Good Writer’. The first lesson is on Planning. I’m starting a new book on Wattpad called ‘Writing Tips 101: How to be A Good Writer’. In here I’m going to be sharing what I have learnt in my years of writing. I’m not a professional (yet!) but I know enough that I can share with others. Every time I post a new part with a new tip, I will post the link in a new blog so everyone on here can benefit. I am open to all questions, suggestions and comments. I’m really excited about this. I love writing and I love helping people become better writers. Have you ever been like this? I have, many times! This isn’t relevant just for blogging but for any form of writing. There is nothing worse than staring at a screen and not being able to get a single word down. So how do you overcome writers block? In this blog, I will provide five tips that I personally find useful. I’m not saying it will help every single one of you because we’re all different, but I hope some of you will find it helpful. 1. Just stop. Step away from the computer and take a long, well earned break. Sometimes you write something for so long, ideas run out and you get stuck. It’s called overdoing it. So taking a break for a while can quite often do wonders. Even if it’s for a few days or more, it will help. 2. If you know what’s causing the block, try and figure out where it started. Sometimes it can be as simple as losing your way. You just need to go through the last few pages and see where you fell short and fix it. Quite often this can fix the block and you’ll be well on your way again. 3. Go for a walk or even just go outside for a bit. Fresh air does wonders because it clears your mind and gets you thinking about other things. If you can’t get outside, or it’s just not your thing, do something else that you know will clear your mind. Work out, read a book, cook, whatever does it for you. 4. Talk to someone else. You must have a friend or family member who knows what you’re writing about so talk to them, bounce ideas between each other. This is something I do a lot with my husband. 5. Sit in a busy place, e.g. a mall, shopping centre or pub, and just observe the goings on around you. Listen to how people talk, listen to their conversations (you’d be surprised how many ideas you get from eavesdropping! ), observe how they interact with others, how they walk, what they’re doing. If you’re looking for novel ideas, you may get a character idea. As you know, having a character in mind will lead to a story idea. If you want to write a blog, you might see something happen that sparks an idea. Sadly there are times when you will try everything to combat writers block and nothing will help. This has happened to me on occasion! If that happens, all I can say is be patient. It’s frustrating, I know, but most times it will clear in time. Even if you’ve planned out a story from beginning to end, writers block can still occur. A plan is just that, a plan. It’s there as a guide but you still have to fill in the gaps. Writers block is almost inevitable. I once read somewhere that writers block is when your imaginary friends don’t talk to you. So get them talking, give them something to talk about! Well that’s all from me. I hope this is useful. 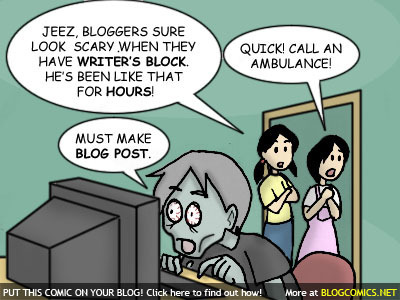 If you have any other tips to combat writers block, please leave a comment. I would love to hear what other ideas can help!